Last week, I had the opportunity to go to Braila (Galati’s neighbor city) and listen to Mihail Neamtu – a young Romanian theologian whose writings I have followed over the past few years. I am a fan. Recently, he has established a political movement called the New Republic (Noua Republica), which will soon become a political party. 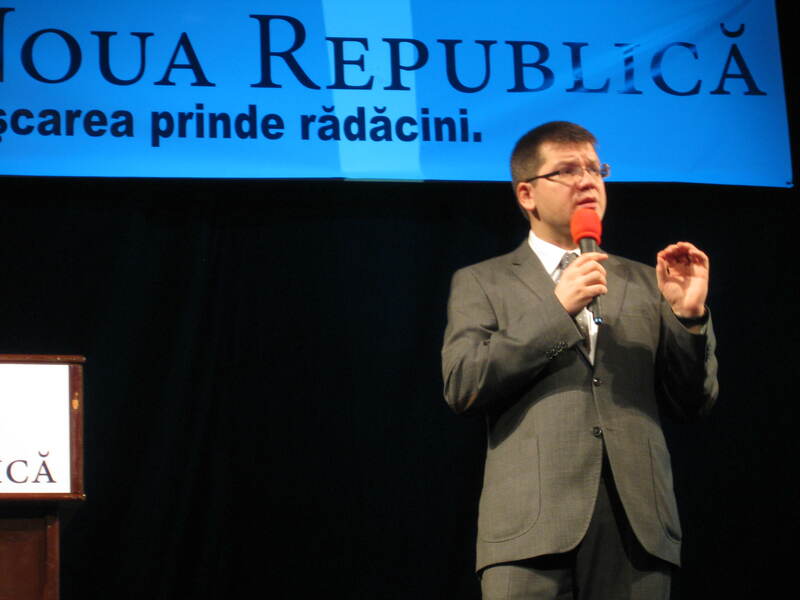 Neamtu explained the concept of the New Republic whose logo is a tree, rooted in Romania’s long tradition and extending upward towards Romania’s future. Neamtu criticized Romania’s government, which since the fall of communism in 1989 has claimed to be socialist. The socialist government has promised to provide education, health care, and the security of the police. However, students are obliged to pay all sorts of fees. If they want to succeed in school, they have to pay for tutors. As for health care, one must pay for needles, syringes and medicine, not to mention paying bribes for nurses and doctors to provide medical care. As for the police force, there are cities in which the police is impotent in the face of mafias and the illegal underworld. While this is nothing controversial or surprising, Neamtu simply pointed out that the government claims to be socialist – something that many citizens would affirm without hesitation – but largely fails to deliver on its claims. In opposition to the narrative of socialism, Neamtu is promoting the New Republic as a party on the right of center – something missing from the political spectrum in Romania. In his discourse, Neamtu drew on the ancient Greek idea of the agora: the public square in which civic discourse and commerce take place. Neamtu said that in today’s economy in Romania, the agora is dysfunctional. Instead of a context of free trade and in which competition creates expertise and specialization, Romania has a clientele economy. There are clients who are privileged in the marketplace because of friendship and family or because of bribery or blackmail. This cultivates corruption and impedes development. While Neamtu didn’t mention that the ancient agora also privileged a certain clientele – namely the male, landowning citizens – he did advocate for laissez-faire capitalism in which agriculture, industry, technology and investment are encouraged. This he sees as a response that will alleviate poverty in Romania. Neamtu also articulated the hope for a country in which Romanians would not feel impelled to migrate in order to succeed, but rather are encouraged to participate in building a country that could be passed on to future generations. While his promotion of personal investment, responsibility and work is a welcome and appropriate response to the present needs in Romania, Neamtu failed to address the weaknesses of globalization and consumerism. At the moment, the New Republic is at the stage of articulating its ideas and ideals and of recruiting adherents. Realistically, I don’t see the New Republic being elected to office – at least in the short-term. But it can and increasingly is introducing new ideas into the public debate. And it can stimulate fresh imagination for the politically conservative. I appreciate that Neamtu is not organizing the party around himself but rather around values. It remains to be seen who are the personalities, other than Neamtu, that will publicly promote this new party. The party’s stated values are: citizens, people, justice, free trade, faith, memory and the voice of future generations. However, there is need for these values to be better described and less ambiguous. For example, the New Republic describes citizens as participants in civic society and not simply consumers. But what do they mean by “faith,” especially in an increasingly context of religious pluralism? Also, as Neamtu declares the New Republic being a movement of the middle-class, how do they reconcile the middle-class with right-wing politics that, speaking strictly as a historical posture, sides with the bourgeois and, speaking contemporarily, has facilitated the increasing disparity between the upper and middle-class as wealth is more and more concentrated in the hands of a smaller and smaller minority? While the New Republic is bringing fresh ideas and a healthy critique to the status quo, the movement’s strength can also be its weakness. Namely, it lacks experience. I am looking at whether the New Republic can attract those with some level of experience in public administration and political engagement to help implement their ideals into reality.